Attention all Sunset Students………..Get creative and design a logo for this year’s Fun Run shirt that will be given to all students to wear on Fun Run day, May 20th. 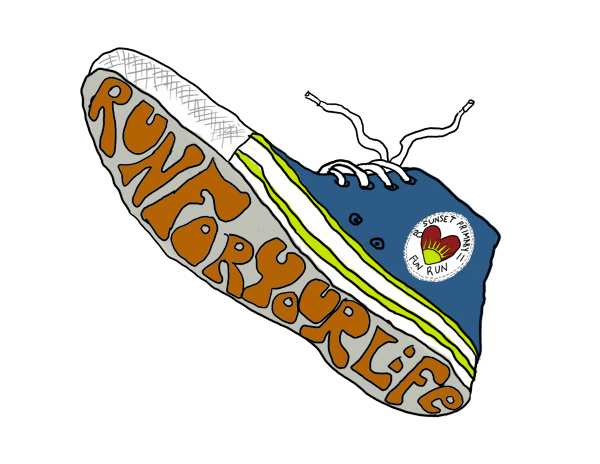 This year’s Fun Run theme is: RUN FOR YOUR LIFE! Attached are Fun Run T-Shirt Design guidelines for the contest. All entries must be turned in to the office no later than Friday April 1st. The winning shirt will be revealed on Fun Run day! UPDATE: I turned in the design on April Fools as planned. They used the design for labeling water bottles. Everyone enjoyed the sun and the run. That is the best looking shoe I’ve ever seen!